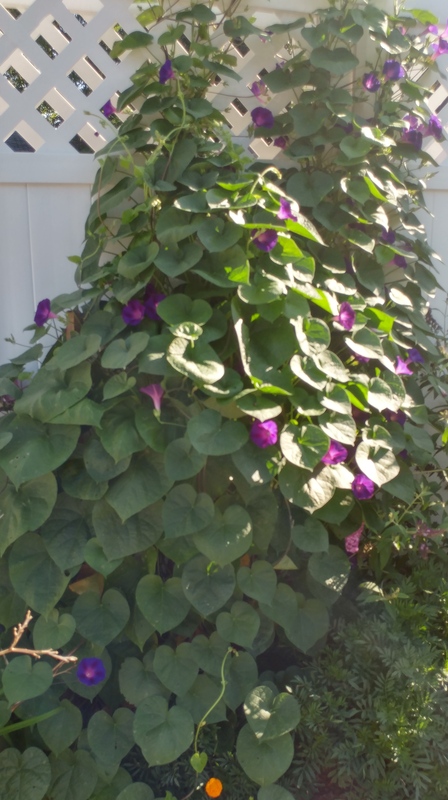 Pretty soon my morning-glory will be bursting with beautiful trumpet flowers. This batch of vines growing here as a result of self-seeding and transplanting. I am surprised that they survived being transplanted as they dislike that very much. Care was taken that when I removed the young plants I dug up a lot of dirt with it. The vines are growing so rapidly, outgrowing the stakes I had placed for them to climb. Planning to add more stakes so they can expand to display their heart-shaped leaves and produce their fragrant, colorful flowers, attracting butterflies and hummingbirds. New additions to my garden is ongoing. Two healthy dill plants were added. I am not a fan of dill but decided to grow some to attract butterflies and garden helpers. Now that dill is a part of my garden I might eventually start to explore more uses of it in my culinary art. Cilantro has been an addition to my garden and has grown back year after year from reseeding. Occasional I would cut it back to promote new growth. One cannot avoid the release of that pungent fragrant. The bold fragrance is nothing compared to its wonderful flavor. It’s leaves are so full of flavor when added to my culinary dishes. It has started to seed now that the hot sun is bearing down on it. From time to time a few garden visitors would peep in to inquire when the plant is in blossom. I planted two lavender plants to aid as companion plant to the cilantro, along with the dill growing a few steps away, next to the thyme. My tomatoes in pots are on the isle close by. Early spring and fall I occasionally put some spinach in. That makes a pretty good companion gardening thing going in my garden sanctuary growing outside. Thyme has been a faithful garden companion over the years and come back every Spring. Thyme with it’s culinary, medicinal and ornamental uses have long been a part of my growing years and will not be an afterthought when I make soups, whether dried or fresh from my garden. My mother, Loretha, affectionately called Lurry (by my Dad) would never cook a pot of soup without having some thyme in it. It gives off a wonderful flavor that is welcoming to one’s taste buds. This is probably one of the most important medicine in my garden with its antioxidant, anti-fungal, circulatory, heart, vision, immune system boost abilities. I have had basil growing inside over the years but somehow managed to successfully killed it. My friends might not think that the green-thumb that I am, could be guilty of such a crime. My sister, Delmena, gave me a few plants that I plan to cherish. Here are a few basil plants in a retired cookie jar (who was beheaded by Anthony, my son). I must say however, that I didn’t think it was done deliberately. It was more of a cookie monster on a quest for something sweet, when the head came off. This sits on my kitchen window sill so that it will not be left unattended. The other basil plants are growing nicely outdoors. I grew up seeing the valuable medicinal use of basil as practiced by my mom when we were ailing a fever. Her recipe calls for a few basil leaves crushed with various types of mint, blended in with warm water, and rubbing alcohol. She used this to make an ailing sponge bath concoction. My experience as a child getting one of these bath was rather refreshing. This peppermint has been around for years. I remembering digging up the first roots from Pat’s house on Walton Avenue back in the early 2000’s. They had a big patch of it growing at the side of their house. I have transferred and replanted many sections of it over the years. It’s a very invasive type and pops up in various areas of my garden. Earlier this Spring I though it had died but was surprised later when it started to pop up in other areas of the garden. Had it under control for now, and who knows where it will show up next Spring.